Find My Workspace lists over 95% of the executive office suites market in Hunt Valley. Simply click Request Quote to check pricing for one office, or Add to Basket for multiple offices. 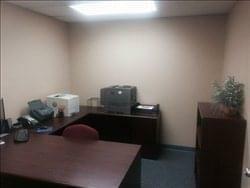 These premises consist of 1 furnished executive office and 2 furnished clerical workstations. There is access to the complete office infrastructure, including telephone system, copier, computer, printers, internet, large conference room, full kitchen, janitorial services provided daily and secure, free on-site parking.